Below is the teaser for my eBook, which offers three short, scary stories for kids who love spine-tingling fiction. Great for reading aloud at ghost-story gatherings, such as sleepovers, around a campfire, in the classroom, or at home for a night of spooky, family fun. Do you like Zombie Loo’s new look? Zombie Loo needed a makeover after my first attempt at the teaser. Here’s the post with some of the out takes in case you missed it last week. Wild Hairy the Werewolf appears in this teaser too. Each monster attempts to read “Cyclops Clyde,” first story in the eBook, but they don’t quite cut it. Watch and see why. Ghost Warrior kicks the fright factor up and will creep out even the bravest of souls. Connie worked overtime and now worries that she’ll be punished with extra pushups for being late to karate class, but pushups become the least of her problems when rival ghost gangs that haunt the parking structure claim first dibs on this mortal prey. If you’d like to download TRIO OF HAUNTING TALES for 99 cents, the links are on the My Books page, here. Ma Cob needs a remake, too. She’s just not scary enough. See what I mean? Plus, she kept messing up the words and needs to memorize the story. Talk about tongue tied. Hmm, another good example of alliteration. So, wish me luck finding a spooky look for Ma Cob and making the new video. I’m going to WriteOnCon for the first time. Have you ever gone to it? Do you have any tips for me? This entry was posted in Uncategorized and tagged book trailer, funny, spooky, werewolf, zombie. Bookmark the permalink. You crack me up, Lyn. Loved the trailer. Loved the Ma Cob's shot, but you're right. It's just not haunting yet, but you'll get there. I have no doubt about that. Thanks, Lee, for your vote of confidence. I'm working on poor Ma Cob's new makeover today. 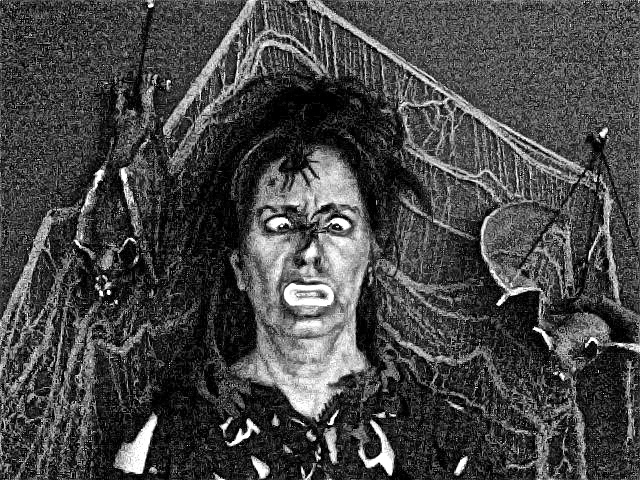 She's scarier, but needs way mo' makeup to show up on camera! Ma Cob! Too much Lyn, but what fun! I always love the pictures you put in your posts. Very fun!Going to have to go wit Ma Cob, wicked fun. Bish – Thank you! Wait till you see Ma Cob's makeover. She's a whole new monster!Wub2Write – It was great seeing you and Joey, too. Thanks for the vote of confidence. iMovie's audio is challenging me big time right now!Robyn – Ha! 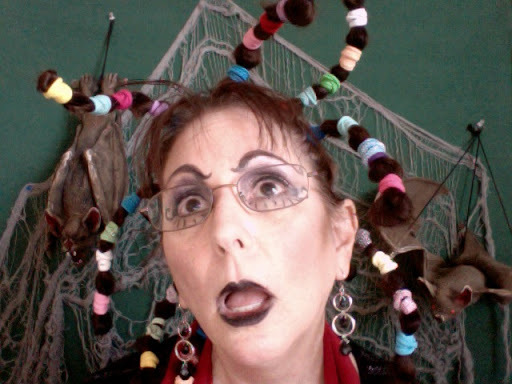 I sure hope you don't go to all that trouble with your hairstyling! My arms got tired and I got a cramp in my hand! I hope you snag one of them thar agents at WriteOnCon.Gene – I'm glad you get a kick out of the photos! Yay for the thumbs up on Ma Cob. I think you'll like her new look. I just keep picturing the eyeballs falling off of the zombie. I think Wild Hairy is my favorite. Amy – Thanks for leaving your comments! XOMisha – Thank you! The good thing about WriteOnCon is that we can go back to the see and see anything we missed. I'm skipping the trailer, but that's because I'm easily spooked. 🙂 Have a great weekend! Eagle – It's very popular and jam packed with so many gems. The neat part is that anyone who missed it or parts of it can go to the site and see what they missed. They even had a link to last year's. J.L. – I'm a big scaredy cat, too, if you can believe it. The video is more humorous/silly than scary! Hope you have a great weekend, too. Aw, thanks so much for stopping by and watching my nutty video. I actually had a ball making it! Haha!